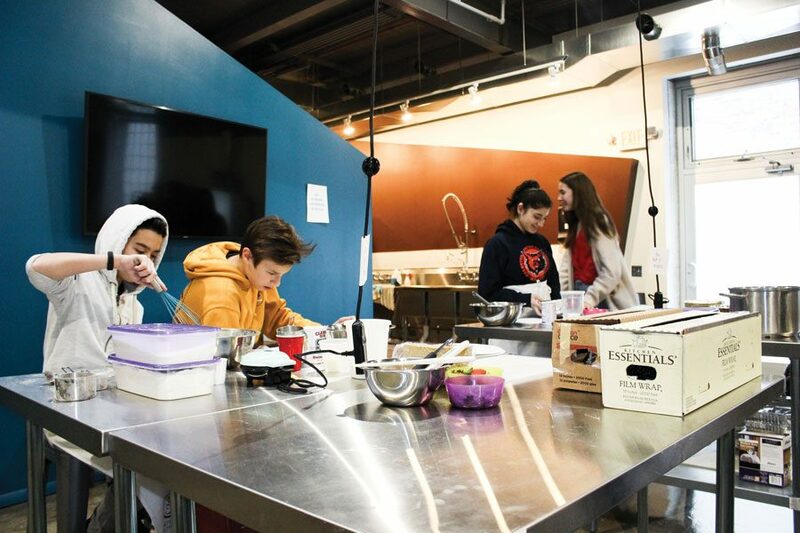 Students practice cooking at Spoonfoolery, a cooking school for kids in Evanston. Spoonfoolery provided meals for federal workers affected by the government shutdown. Mamata Reddy went to the grocery store last week and bought ingredients for home-style recipes in bulk: mac and cheese, garlic-roasted broccoli and brownies. She then cooked 40 meals and prepared to distribute them to furloughed federal workers. Reddy — owner and executive director of Spoonfoolery, a teaching kitchen and event space in Evanston for kids ages 3 to 14 — distributed free to-go meals to furloughed federal workers Jan. 21 and Jan. 25. Meals were available for pickup at 2113 Greenleaf St. for people with proof of federal employment. The federal government shutdown began Dec. 22, leaving roughly 800,000 federal employees across the country without pay. After 35 days, the government reopened on Jan. 25, passing a spending bill to fund the government for three weeks, which should result in these employees being compensated for the work they did without pay. However, in the meantime, many workers remain uncertain of when they will receive compensation. After 20 furloughed federal workers picked up meals on Monday, Reddy decided to continue distribution on Friday and donated the leftover meals to a local church. Reddy graduated from the French Pastry School in downtown Chicago in 2005, and has worked as a pastry supervisor at the United Center and a culinary instructor at the Gary Comer Youth Center. At the youth center, Reddy said she saw the impact of food insecurity when she and other volunteers served hot meals to young people. Parul Gupta, an OB-GYN at Northwestern Medicine, helped Reddy prepare the meals. Gupta first met Reddy at Gupta’s South Asian Women of Evanston group. To cover the cost of groceries, Reddy started a GoFundMe page. In just eight days, the page had garnered 118 shares and raised over $1,600. Reddy said she would donate the remainder of the money to promote food security. Reddy said that while she could provide the labor and facilities to prepare meals for furloughed workers, she lacked the financial means to buy ingredients because her business only opened last September. “I am grateful to have both the resources from the community and a professional kitchen to help federal employees,” Reddy said. A previous version of this story incorrectly stated that Reddy would donate the remaining money from her GoFundMe campaign to the city. She plans to use the money to promote food security in other nonprofit work. The article also mischaracterized Reddy’s work at the Gary Comer Youth Center. The Daily regrets these errors.